It's Tuesday morning, and we are up and running! We will be bringing you live coverage with updates every hour. Check back soon for our first update. While you're waiting for our first update(s), be sure to cllick on the above link to see live streaming video feeds from the Yukon Gear & Axle booth. The Randy's girls are here for your viewing pleasure. Still working on getting our second webcam online. Our Internet connection is also a little slower than it should be, so we are investigating this as well. Once the second camera is online, I'll be hitting the red carpet and taking pictures. In the meantime, a couple of the Randy's girls would like to say hello. Erica is flying in this afternoon, so all 3 girls will be here then. 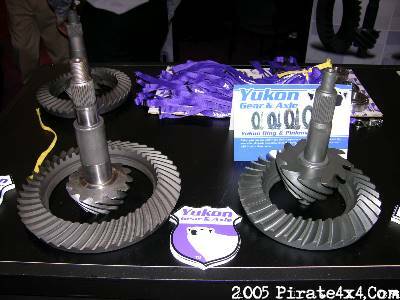 Pirate4x4.com headquarters in the Yukon Gear & Axle booth. If you look realllllly hard, you can see the camera mounted underneath the black cross bars under the main Yukon sign. Well before I walk the 31 miles of floor space here at the SEMA show, I figured I would show you what's new with our host company - Yukon Gear & Axle. Yukon has released their new Dana 60 and Ford 9" ring and pinion sets. These units appear to be of extremely high quality, and rival OEM applications. 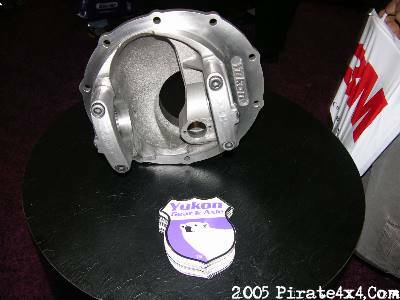 Yukon has released their sweet new aluminum and nodular iron Ford 9" 3rd members. 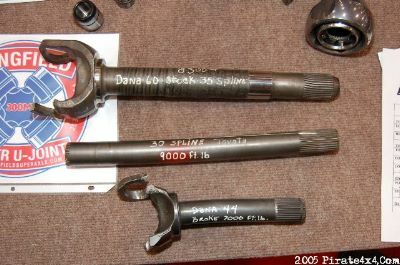 Both units feature beefed up bearing caps, with the nodular housing using forged 4140 Chrome-moly. 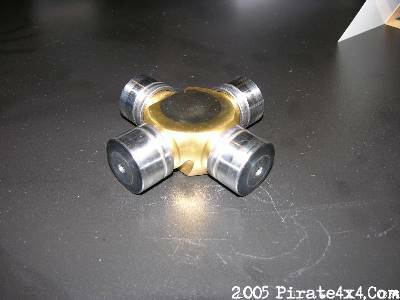 Yukon claims the bearing caps are 30% stronger than the competition. This increased strength should greatly reduce ring gear deflection under load. 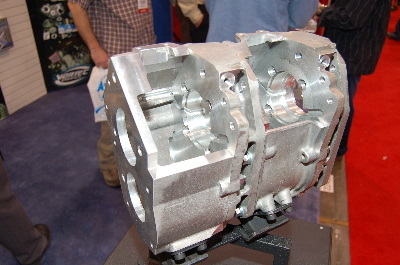 Yukon is currently in production of this prototype Dana 60 Superjoint. It's made of forged 4340 Chrome-moly and have a titanium nitride coating that gives them a surface hardness of 70 Rockwell and reduces friction and wear. The cross sections will come with a lifetime warranty against breakage. They will be available in about 90 days. Camo just returned from the Mittler Brothers booth, and wanted to show us their sweet electric variable speed bead roller. This bead roller makes professionally looking panels, and it's easy to do - even for a novice. 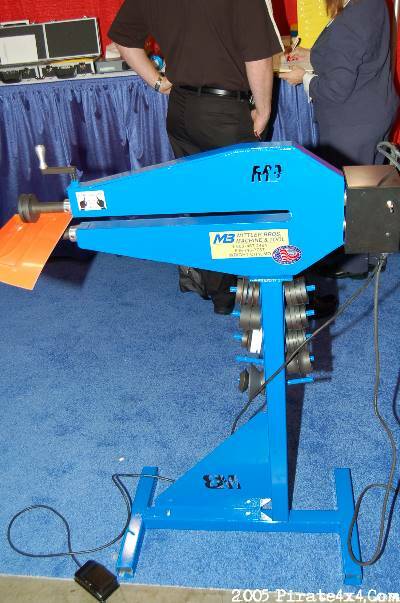 The bead roller is available directly from Mitt ler Bros for $550 which includes one set of dies. I took a long walk through one of the convention halls in search of cool stuff. I was suprised at the abundance of ultra cool stuff as in years past, but the week is young, and I have a ton of walking left to do. One of the coolest things I've seen so far today has to be Mastercraft's new reclining suspension seat. This is a full race suspension seat that reclines just like a stock OEM seat. I personally have been wanting something like this for a very long time. Kudos for Mastercraft for coming out with something cool! Mastercraft reclining suspension seat. Hot brunette not included. I cruised on over to ATS Diesel Performance where owner Clint Cannon was displaying all kinds of sweet new stuff for diesel tow rigs. 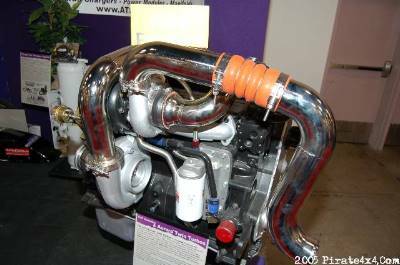 One of the cooler things they had on display was their new twin turbo system for Dodge diesels. The system is capable of boost numbers around 60psi! This system uses their own Aurora turbos in a series to provide massive power. ATS twin turbos available for all Dodge Cummins motors. We came across Robby Gordon's Red Bull Trophy truck just a few minutes ago. There was something noticeably different on it. Take a look at it and see if you can tell what it is. Can you tell what's different about Robby's trophy truck? I'll give you a hint - Daddy's got new shoes! I've just uploaded a ton of photos to the photo gallery. Check out the gallery here. I took a stroll to see what was going on outside. The UROC All Stars were putting on a show out on the Supercrawl courses. UROC Modified champion Ford Motorsports sponsored Lovell brothers were out there showing the SEMA crowd how it's done. The UROC All Stars putting on a show for the SEMA crowds. I did notice one thing so far today. The significant decrease in hot models at the show. Now granted, I have not been down to the tire and wheel hall where most of the models hang out, but there seems to be a decline in hot models this year. I'll save the tire and wheel hall for tomorrow, so you all have something to look forward to. The Nopi girls across from the Yukon booth are looking niiiiice. Well that about wraps it up for the day. We've got a lot more ground to cover tomorrow, so be sure to visit again at 9:00AM. Also don't forget to check out our photo gallery, as we have hundereds of images posted already. We're back for day two! The Randy's girls are here in full force signing posters and calendars and looking better than ever. Sometimes being a computer nerd has its perks! This morning Warn announced it's year long contingency award for the team with the most wins throughout the 2005 season running a Warn winch. It should come as no suprise that Dean "Iceman" Bullock and "Krazy" Karl Mumford were the winners of this $5000 bounty. A huge congrats to who is the undisputed most winningest team in rock crawling history. 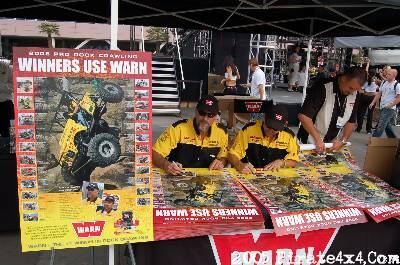 Iceman and Krazy Karl sign posters at the UROC proving grounds. Yahoo Autos has hotties out and about handing out cards that could be good for a Mitsubishi to take home. Bobby Long is here showing off his new Dana 60 u-joints and ultra strong axles for Toyotas. He even had his axle breaking machine on hand to demonstrate how he tests an axle's strength. Longfield 30 spline super axles are incredibly tough! The crowds are getting thick today. It's getting tougher and tougher to get good pictures due to the crowds. As usual, Ford has a massive display, with mouthwatering vehicles and equally beautiful models to compliment them. Camo just returned from the Full Traction Suspension to share news about their new Ford Superduty suspension kit for '99 - '04 Superduty trucks. The kit converts leaf spring Superduty Fords to a 4 link style suspension similar to the 2005 Superduty trucks. The kit comes with coilover shocks and is a 100% bolt on system. The kit should be available mid December with an MSRP of around $3,500. 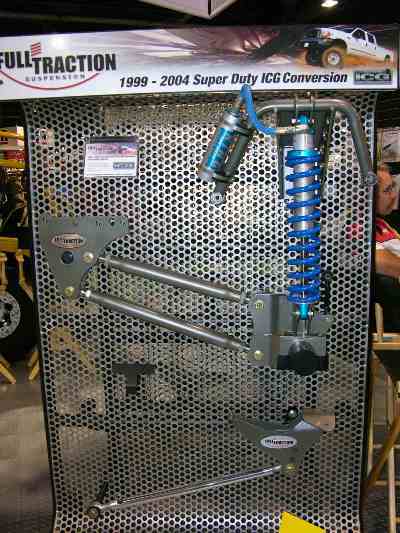 The new Full Traction Suspension kit for '99-'04 Superduties.. I stopped by the Ramsey booth to see what's new. They have just released a new entry level winch called the 9.5e which has an MSRP of $760. This winch has a series wound 3.8hp motor and features a 12ft. controller and 95ft. of cable. Line speed is rated at 30 feet per minute and it comes with a hause fairlead. 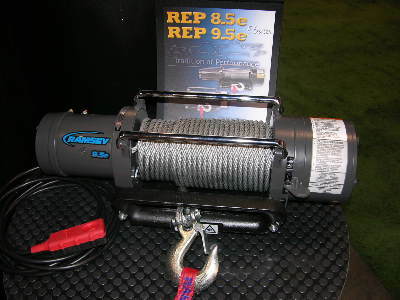 Ramsey's new 9.5e entry level winch.. ARB had a fairly unique product in their booth. Called the "X Jack", it's an inflatable jack capable of lifting 8,000lbs with only your engine's exhaust. 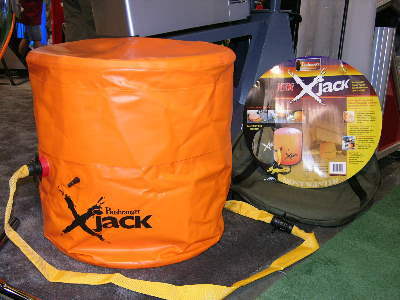 The X Jack comes with a carrying case, ground mat, gloves, and repair kit. The MSRP on the X Jack is $282 and is available from any ARB distributor. I just got back from the tire and wheel hall. This hall is pretty nutty, with crazy stuff like 30" rims, and more silicone than you could imagine! Complete with a Dana 44 front end and Dana 60 rear end. Bling Bling! While prowling the booths of the tire and wheel hall, I managed to get quite a few pictures of the ladies of SEMA. I created a seperate photo gallery just for them. You can check it out here. Check out the "Girls of SEMA" photo gallery here. 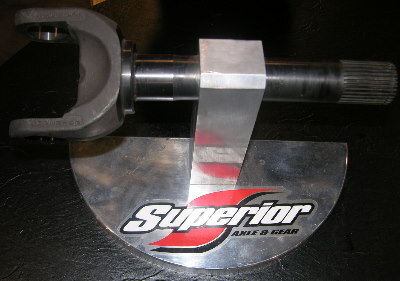 Superior Axle & Gear was showcasing their Discovery Series line of axles here at the SEMA show. These shafts are made in India but are made from the same blueprint with the exact same material, an heat treat process as the Evolution series axles. The Discovery Series shafts come with a 10 year warranty while the Evolution series shafts come with a lifetime warranty. The Disco axles are about 35% cheaper than the USA made Evolution Series. Superior Axle & Gear now offers two axle series - The top of the lin Evolution Series, and the more affordable Discovery Series. 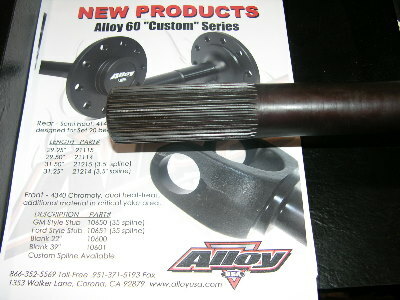 Alloy USA now offers the "New Builder Series" line of axles for the Do-it-yourselfer. These shafts are 4340 chrome moly and offer longer splines so you can cut them to length. There are 4 part numbers to accomodate most size requirements. Alloy USA "New Builder Series". The Girls of SEMA Photo Gallery has been updated with another 50 pictures. Be sure to check it out. Toyo tires made their official announcement here at SEMA that they have signed Robby Gordon for a 2 year deal. The deal includes the Dakar Rally, and all Score events. Rumor has it the deal was for about 1.2 million, but that's unconfirmed. Robby has always been with BF Goodrich, so this was quite a suprise to many people in the industry. Robby Gordon announcing his new tire deal with Toyo Tires. The Hummer in the background is his new Dakar racer.. 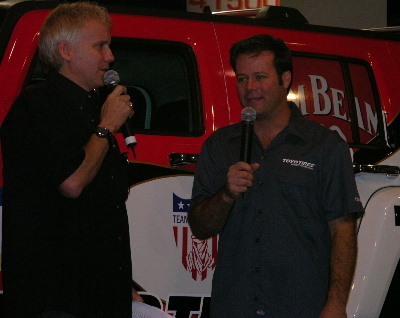 In other Robby Gordon news, Andy Mc Millian will be driving the Red Bull trophy truck for RG Motorsports in 2006. 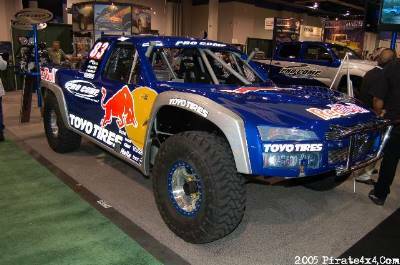 While Andy will run the truck throughout the 2006 season, Robby will still drive it in the Baja 1000 and 500. The day is winding down here, and it's just about time to call it a day. Camo just came over and gave me some info regarding a picture we posted yesterday in the photo gallery. 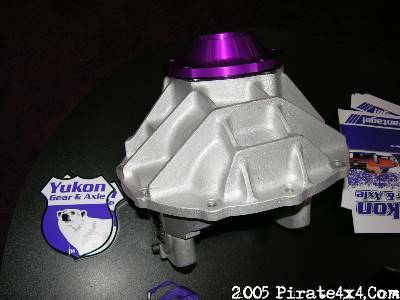 AA Toyota dual case housing. The Advance Adapters Toyota HD dual case housing is a great option over having to scrounge through the junk yards to find a donor case for your dual case setup. The MSRP is $239 and is available at any AA dealer. Warn has released a new winch called the Warn 9.0RC. Based on the proven competition 9.0R that took Warn sponsored teams to 50 out of 54 wins during the 2005 Rock Crawling season, the new 9.0RC should be a winner. It features a short drum design to fit in todays compact tube buggies. 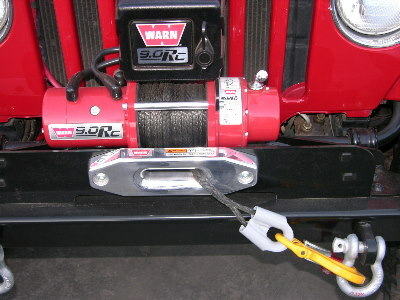 The 9.0RC is the first Warn winch to come with a synthetic rope. It has a new control unit with a built in light. The 9.0RC will be available mid December. Diana took time out from her poster and calendar signing to have a little fun with the camera. Check out the Girls of SEMA photo gallery for more pictures of Diana. One of the most unique 'show trucks' at the show was this old Ford. Parked among the lowriders and Escalades with 22's, this thing was actually very cool. It might look rough in this photo, but upon closer inspection, it was rather amazing. 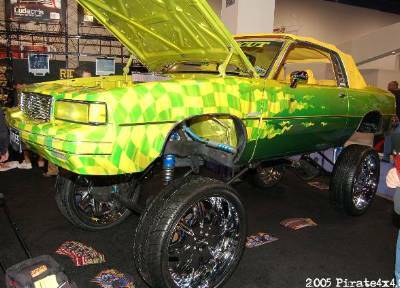 The front bumper is painted with "party 'till you puke". 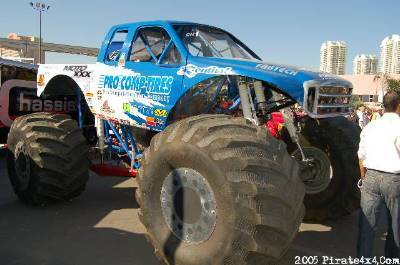 Pro Comp Tires had their monster truck on display this week. The Grave Digger monster truck was here as well. 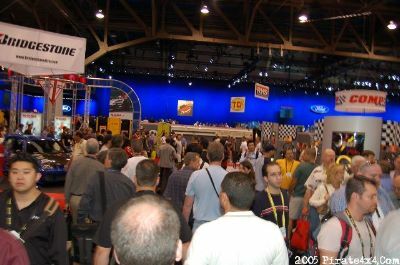 We are winding down here at the 2005 SEMA show. A lot of ground was covered, and we hope you enjoyed our coverage. 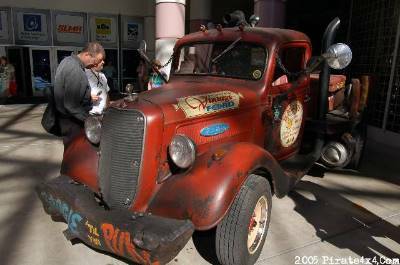 If you haven't already checked it out, please visit the 2005 SEMA photo gallery. There are over 400 photos in the gallery, with almost 100 Girls of SEMA photos. The UROC/Warn rock crawling proving grounds was in my opinion a huge hit this year. I hope that the rock crawling presence at SEMA will help our industry as a whole. Growth of our industry means more options and technology for the average-Joe wheeler. See you next year!